Master farrier Doug Bradbury, FWCF of Clay Cross, Chesterfield, in Derbyshire, England has been recognized by The Queen as a Member of the British Empire (MBE) “for services to the farrier profession and the community in the East Midlands” . The recognition is awarded for an outstanding achievement or service that has had a long-term, significant impact to an individual who stands out as an example to others. The announcement was made on Friday evening, December 29, by the official newspaper of the Crown, The Gazette. The Queen’s annual announcement of the honors is part of the royal New Year celebrations. Doug Bradbury has a distinguished history in both his community and in the farrier profession. He is currently retired from actively shoeing horses, but is the head of three generations of Derbyshire farriers, including his son, Neal Bradbury, AWCF, and grandson, Thomas Ross Bradbury, DipWCF. However, Doug Bradbury is far from inactive; he has transformed the old forge offices into a carefully-curated museum of farrier history, known as the UK Horseshoeing Museum, and offers colorful and interesting “The Life of a Farrier” lectures to groups across the British Isles. Born July 1, 1937, Doug Bradbury was headed for a career underground in the Parkhouse Colliery in his home village of Clay Cross. “It was either down t’ pit or in t’ army,” Doug recalled years later. His job below ground as a pony driver was short-lived, however, after he developed pneumonia. 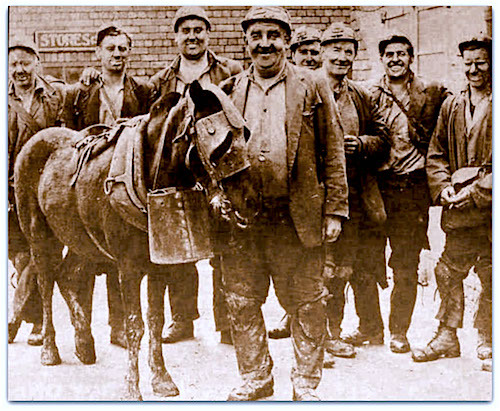 This photo shows a pit pony being shod underground at the Parkhouse Colliery, where Doug worked, although the photo is from before Doug went to work there. But his ability with the mine’s pit ponies had not gone unnoticed, and he was reassigned to become a farrier’s apprentice in the company forge, where he worked seven days a week. The colliery owned as many as 300 ponies at the height of its operation. Until 1962, Doug Bradbury was in demand across coal country, as farriers were scarce and much needed at the mines. Parkhouse loaned Doug's services and expertise to the ponies working in other mines. At his last job, he went below ground to shoe ponies at 6 a.m., emerging in mid-afternoon to tend the needs of horses for private owners in the area. In 1968, Doug and his wife Joan bought a new home with a forge where he could be self-employed. Farriers were still scarce in Derbyshire; Doug recalls being one of only three farriers in the county. He kept on working seven days a week, and remembers people bringing their horses to the forge even on Christmas Day. “It was a man’s living and he would do all he could to keep it going,” he recalled in an interview. Doug Bradbury spent his apprenticeship and more than 30 years shoeing pit ponies in the coal mines of the East Midlands. The ponies lived underground; a mine might have as many as 300 ponies in their pits. This is Duke, the last pit pony Doug shod. This photo is in Doug's museum. Over the next 50 years he wasn’t often alone in his forge, however; he shared his knowledge and skills with a long list of apprentices who trained under him and fellow farriers from around the world who gravitated to the little town of Clay Cross for extra tutelage or skill development with Doug. His son Neal joined the business as an apprentice in 1980. Gradually, the business evolved into the mobile practice that Neal operates today, along with his own son and former apprentice, Thomas. Doug Bradbury received the Fellowship of the Worshipful Company of Farriers in 1986 by examination of his skills and approval of his written thesis. Presently, there were only 37 Fellows in the world, according to the Company roster. At the same time, Doug became a Liveryman of the Company and earned the Freedom of the City of London. 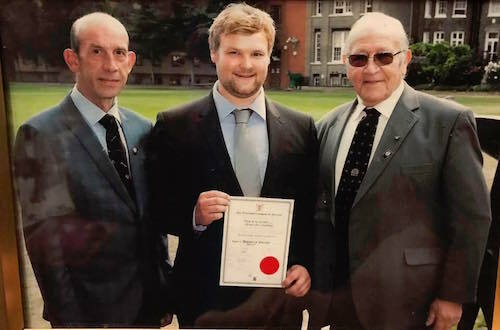 Doug, who turned 80 in July, served as an examiner in the Worshipful Company’s system, and was an inspector for the Farriers Registration Council. He is one of only 74 in all the United Kingdom to have earned the title of “Master Farrier” from the Worshipful Company. unusual shoes like this celtic wavy rim shoe. The date is estimated to be 9th or 10th century. 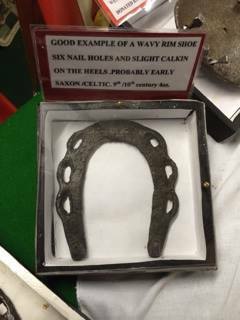 Collecting odd and unusual horseshoes and tools of the past was a hobby at first for Doug Bradbury, but after his retirement, more formal and labeled exhibits of his collections took over the forge buildings behind his house. He has especially interesting collections relating to military farriery in both World Wars, but the exhibits cover all the special needs of horses when they were working the streets, mines, and put to tasks that required special traction, such as working on ice and snow or maneuvering through deep mud in bogs. Doug Bradbury is known worldwide, and has traveled to far off lands to help educate farriers or shoe horses on assignment. He lives in rugged country far from the top racetracks and showgrounds but the farrier world certainly beat a path to his door. His reputation is one of generosity and knowledge; he is known as a man who has the ability to not just do top work but to be able share what he knows. 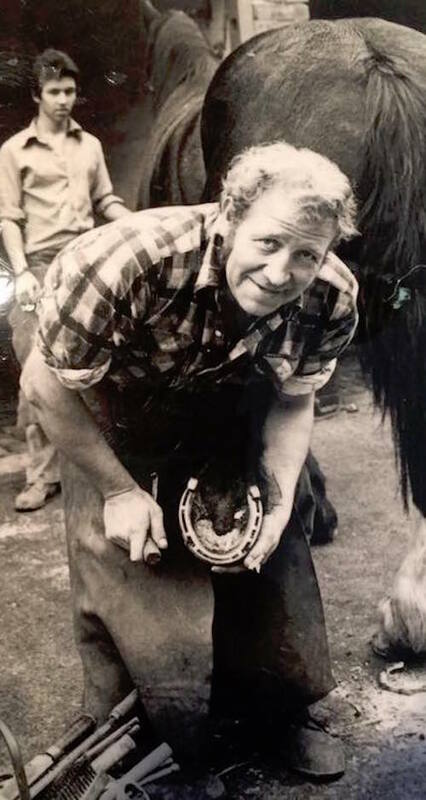 Doug Bradbury’s life has been a genuine effort to improve both the skills of fellow and future farriers, and to protect the wellbeing of the horse. He has shown that the past and present are both important. His recognition by the Queen with the MBE Honour in 2018 is affirmation of the qualities that so many in the horse world and farrier profession have known and appreciated for decades, and will never forget. Thanks to the Bradbury family, Jonathan Nunn and Grant Moon for assistance with this article. The future of hoof science is on HoofSearch today. Be informed! Click to subscribe or email for more info. © Fran Jurga and Hoofcare Publishing; Fran Jurga's Hoof Blog is the news service for Hoofcare and Lameness Publishing. Please, no re-use of text or images on other sites or social media without permission--please link instead. (Please ask if you need help.) The Hoof Blog may be read online at the blog page, checked via RSS feed, or received via a headlines-link email (requires signup in box at top right of blog page). Use the little envelope symbol below to email this article to others. The "translator" tool in the right sidebar will convert this article (roughly) to the language of your choice. To share this article on Facebook and other social media, click on the small symbols below the labels. Be sure to "like" the Hoofcare and Lameness Facebook page and click on "get notifications" under the page's "like" button to keep up with the hoof news on Facebook. Questions or problems with the Hoof Blog? Send an email. Great article, very enjoyable to read about Mr. Bradbury, his upcoming recognition by Her Majesty, & his legacy.